Michelle and Ian got married at the stunning Knowsley Hall, Merseyside’s only stately home and remains a hidden treasure. Edward Stanley, who inherited the 19th Earl of Derby title following the death of his uncle inherited Knowsley Hall Estate and Knowsley Hall Safari Park. Lady Derby restored Knowsley Hall to it’s natural beauty, becoming a stunning venue for private and exclusive fine dining events including weddings. Making it the 5 Star stately home it is today and the ideal venue for a Knowsley Hall wedding. As the wedding day began… Michelle was with her Bridesmaids, Mum and Nan, Aunty, Sister and her good friend Cara, having a Champagne Wedding survival hamper made up for her Bridesmaids as they got ready with her was a really nice touch. Although very emotional, Michelle received a gift from Ian… a beautiful necklace from Boodles with an ‘M’ pendant, whilst Michelle had sent the most amazing Rolex watch as a gift to Ian, he was overwhelmed. With bridesmaids dresses in Cream Ivory were from Puure Bridal. Michelle says ‘I was cool as a cucumber until my Dad entered the room’. Seeing the bride all ready and wearing her Amazing Wedding Dress from Eternity Bridal Wear set emotions flying once again and the day hadn’t even started the ceremony! Even the little touches throughout the day were magical, with Ian having his shirt cuffs embroidered with their wedding date, suit from Gieves & Hawkes. A great idea was having a picture frame on the entrance to the ceremony room stating ‘ As two families become one, pick a seat not a side’. Walking down the grand stairs to the ceremony with her Dad by her side, she saw Ian standing waiting for her and looking amazing and the ceremony began. Ian’s Dad did a beautiful reading and there wasn’t a dry eye in the room which when it came to saying their vows to each other they struggled to hold back their emotions. Guests where treated to a Sneak Peak of their Pre-Wedding photographs with a Signature picture frame encasing a photograph from their shoot for guests to sign. This is a great idea and lovely way of creating the most memorable keepsake of your wedding day. After the wedding breakfast and speeches we got some gorgeous wedding photographs in the grounds of Knowlsey Hall. Having their guests throw confetti over the newly weds was a stunning moment. By also using my wedding videographer we had these moments captured the most gorgeous cinematic way. With their I & M initials set beside their wedding cake – which was made by her cousin – and table quotes ‘ Limitless’ ‘Love you Always, Love you still, Always have, Always will’ it was a love fairlytale coming true. Their wedding breakfast was dress in cream ivory with little gold gift bags as favour’s with handwritten tags saying ‘Eat Me’. 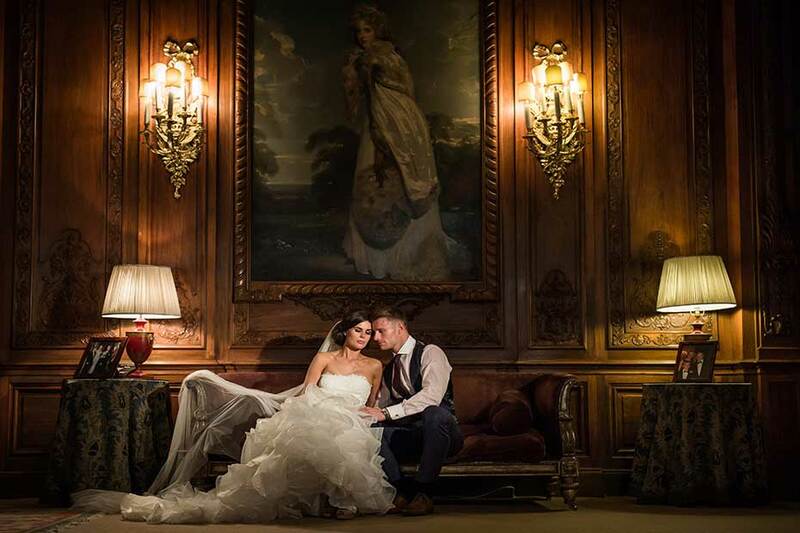 Michelle has always had her heart set on a having a Knowsley Hall Wedding. Choosing her wedding photographer was the second most important thing to secure. I can’t thank Michelle and Ian’s enough for choosing me to be part of their day, it’s always been one of my favourite wedding venues in Merseyside. The day ended with the most beautiful sunset with Michele and Ian having a dance by the entrance of Knowsley Hall. If you would like to see more Knowsley Hall wedding photography, click on the link provided to see other weddings.